Seventy-six years ago, people of a certain ethnicity were rounded up and transported to concentration camps. This happened not in some distant citadel of despotism, but in the “land of the free,” from the shining sea of the Pacific to the diamond desert of the western interior. It happened in the United States of America, and the island I call home is where it all began. After Pearl Harbor, everyone of Japanese ancestry (the Nikkei), whether or not they were born in America, became objects of suspicion in the eyes of their government. 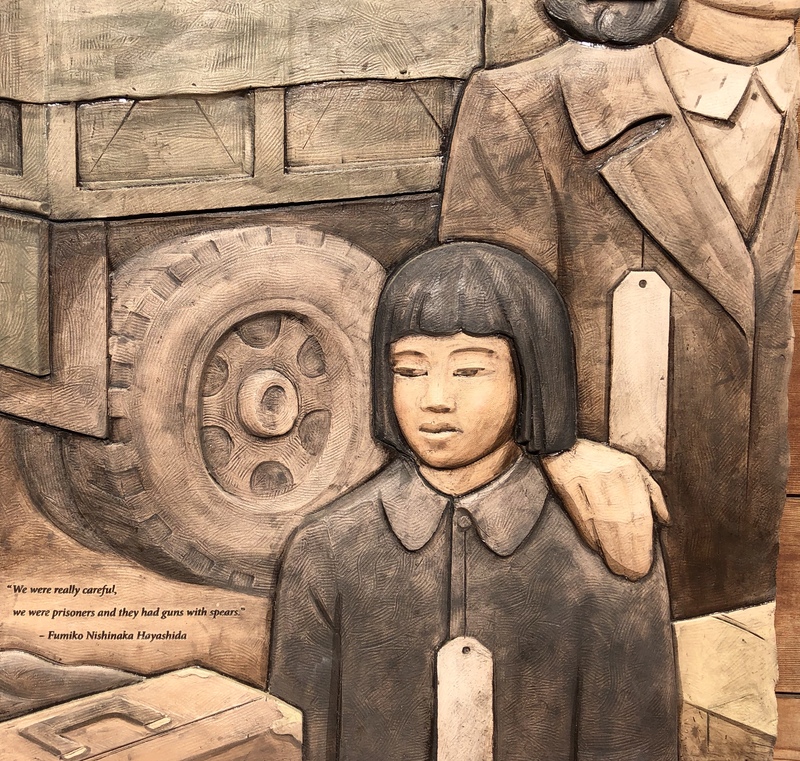 On February 19, 1942, President Roosevelt signed Executive Order 9066 calling for the exclusion of “any or all persons” from areas deemed sensitive for national defense. Although around 14,000 people of German or Italian ancestry were interned for at least part of the war, those of Japanese descent were the prime targets, reflecting an anti-Asian bigotry with deep roots in American history. On March 21, after only an hour’s discussion in the Senate and thirty minutes in the House, Congress passed a law authorizing the roundup of 120,000 men, women and children of Japanese ancestry. Of that great number, the first 227 would be residents of Bainbridge Island, six miles west of Seattle. These evacuees comprised a significant portion of the island’s relatively small population. Boasting the world’s largest sawmill––a magnet for job-seekers––in the late nineteenth century, Bainbridge attracted immigrant workers and families, many of them from Japan, even after the mill shut down in the 1920s. By the 1940s, both the Issei (“first generation,” born in Japan) and the Nisei (“second generation,” born in the U.S. as American citizens) had become established members of the island community. But when Pearl Harbor stirred up primal fears of the “other,” 227 friends and neighbors were abruptly severed from their community and shipped off to distant internment camps. Notice of forced evacuation, posted on March 24, 1942. On March 24, the Nikkei of Bainbridge were given just 6 days to settle their affairs and pack their things before military trucks would come to take them away to the ferry dock. For those with property, it was especially complicated. Non-citizens couldn’t own property, and Japanese-born were forbidden citizenship by law, so titles had to be in the name of either U.S.-born children or supportive friends. In any case, what would happen to their houses and land while they were gone? But there were greater stresses. Many reported a sense of shame at being treated like criminals. What had they done to deserve this? What would their neighbors think of them? Steven Gardner panel at the Exclusion Memorial. Perhaps the worst thing was having no idea of where they were being taken, or what would befall them in the days to come. And how had the Nikkei’s neighbors on Bainbridge responded to “the exclusion”? 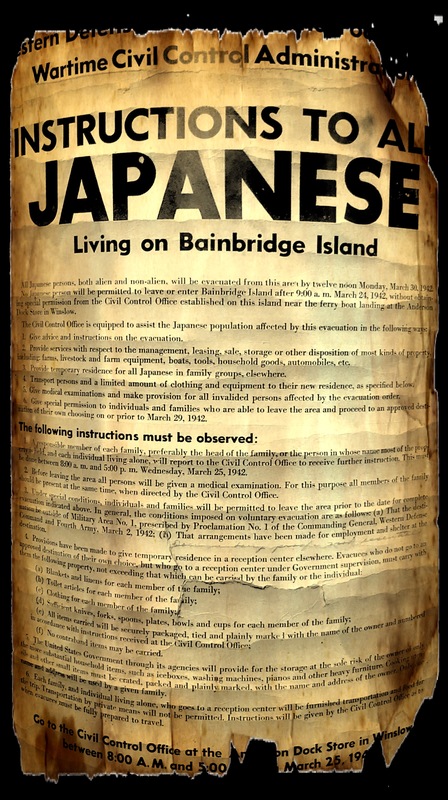 While some residents shared the widespread racism and wartime belligerence of the country as a whole, a majority of Bainbridge Islanders resisted the anti-Japanese hysteria. The bonds of longtime community were stronger than the sirens of fear. 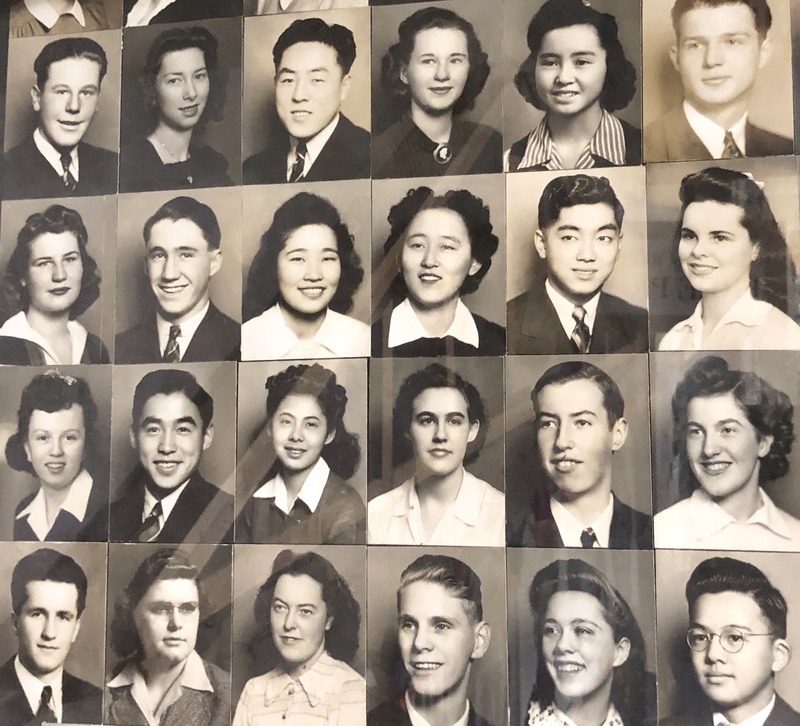 The day after Pearl Harbor, teachers were careful to remind their nervous classes that the students of Japanese ancestry were Americans too. Neighbors pitched in to help the Nikkei families with last-minute logistics. 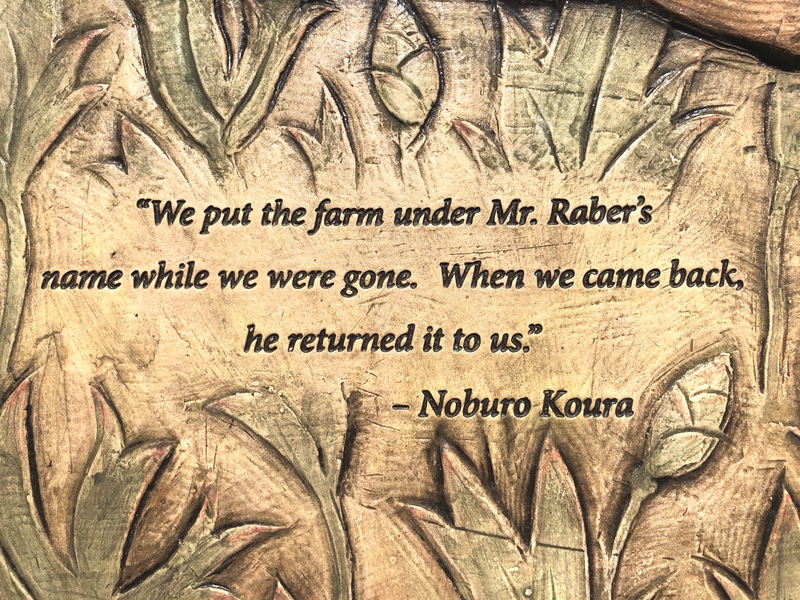 Generous souls took over management of abandoned farms and businesses until the day their rightful owners returned. And the editors of the local weekly newspaper, the Bainbridge Review, mounted an eloquent and courageous defense of the vulnerable. Walt and Milly Woodward, a young couple from Seattle, had bought the paper when they moved to the island in 1940. Their first editorial made a powerful commitment: “Always strive to speak the truth, unafraid, whether it be on a national issue or something purely local.” And so they did. On the day after Pearl Harbor, their front page counseled neighborliness over fear: “There is the danger of a blind, wild hysterical hatred of all persons who can trace ancestry to Japan. That some of those persons happen to be American citizens…easily could be swept aside by mob hysteria.” Walt and Milly continued the fight for constitutional rights and mutual respect for the duration of the war. The Review was the only newspaper in the United States to do so! The Woodwards also hired evacuated high school students to send dispatches from the camps, so that absent neighbors would not become faceless or forgotten. Their stories of exile were read widely back home. Some couldn’t afford to return, and others chose not to, but more than half of the exiles did come back, compared to a much smaller return rate in other places. Bainbridge showed little sign of the nasty anti-Japanese sentiment seen elsewhere. Those who voiced their continuing hostility on Bainbridge found few followers, while there were countless expressions of kindness and goodwill to assist the Nikkei in their resumption of lives interrupted. Steven Gardner panels at the Exclusion Memorial. 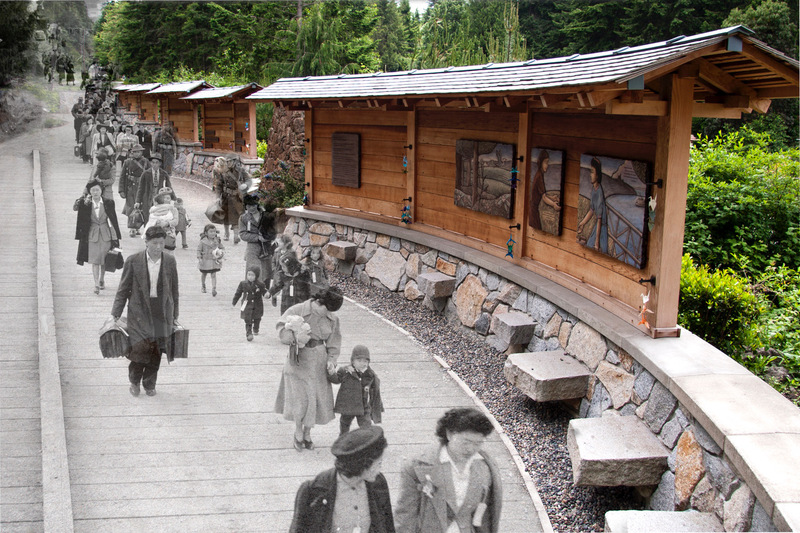 On August 6, 2011, the anniversary of Hiroshima, nearly 600 people gathered to dedicate the Bainbridge Island Japanese American Exclusion Memorial at the exact place where the Nikkei had been removed from the island in 1942. The beautifully designed site is a moving tribute to the dear people of that troubled time, but it also provides a necessary reminder of our perpetual vocation to repair the world by nourishing community and resisting everything which diminishes the human family. 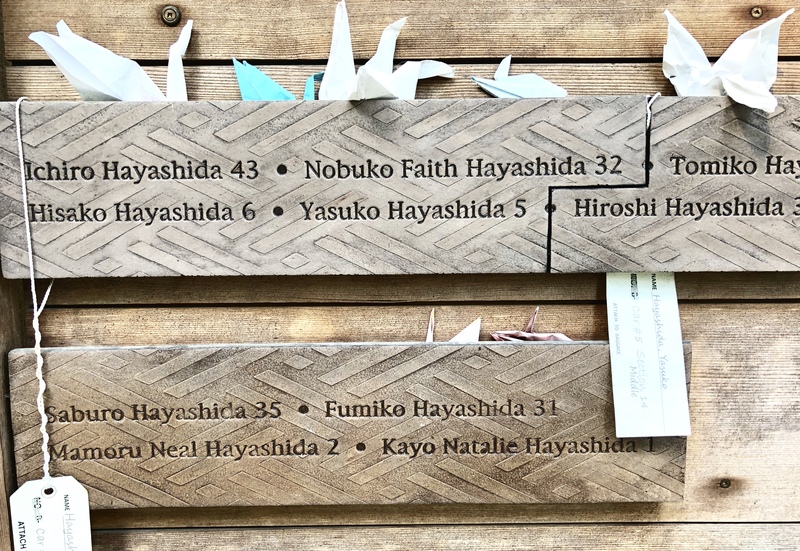 Paper cranes left by visitors at the Story Wall, where the names of all the evacuated Nikkei are inscribed. 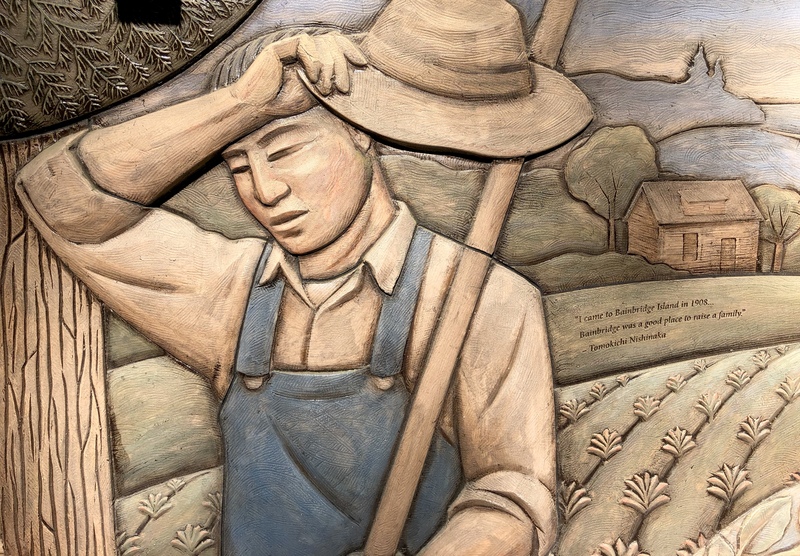 In the Memorial’s peaceful setting beside Puget Sound, a cedar “Story Wall,” designed by local architect Johnpaul Jones, holds the names of all the exiles as well as a series of moving terra cotta panels by Seattle artist Steven Gardner, depicting people and incidents of the exclusion. It is a place to remember––and to hope. 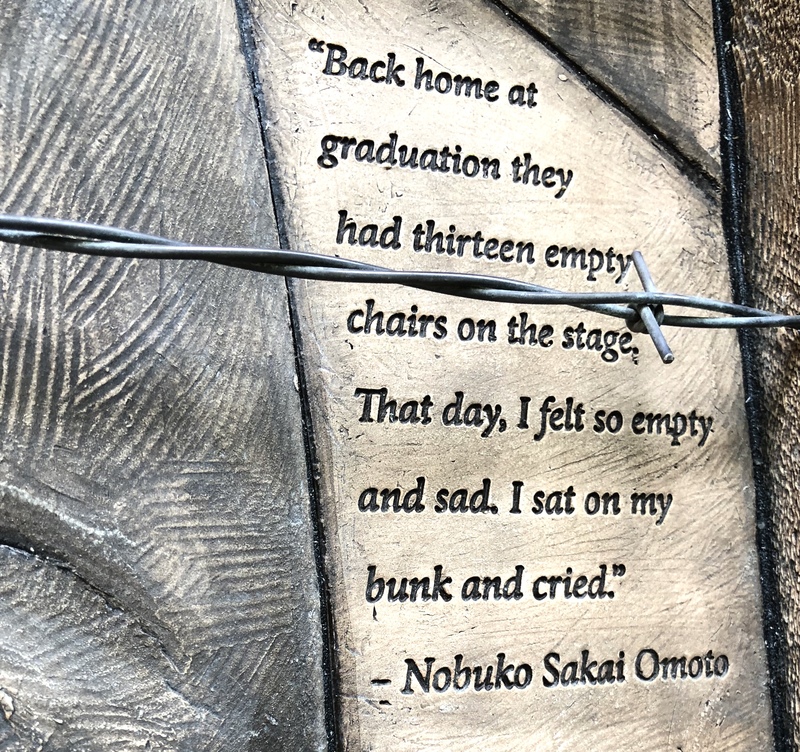 As Sada Omoto, one of the surviving exiles, has said, the Exclusion Memorial wants to “create in you a different sense of being.”This should be a pilgrimage site for every American in this dispiriting time. You will take heart from it. The Bainbridge Island Japanese American Community’s excellent website is also worth a visit for its wealth of fascinating photos, archival films and video oral histories. Most of the interviews quoted in this post may be found there. Nidoto Nai Yoni: Let it not happen again. Just before Independence Day, I interviewed Clarence Moriwaki, a local activist who has been a driving force behind the Memorial project. I looked him up after hearing his eloquent speech at the recent Bainbridge Island rally to “Keep families together.” Like so many of us, Clarence is troubled by the normalization of racism and hatred at the highest levels of our government as well as in the untamed id of cultural rage. From the stigmatization of Muslims to the unspeakable cruelty at our southern border, America’s shadow side is on full display, while the crazier voices on the right tout the 1940s internment as an applicable model for the war on terror. Singling out people based on race and ancestry remains an illness hard to cure. “This is frightening to me,” Clarence said. “We spent months thinking about the motto for the Memorial. We went back and forth, and what we decided on was Nidoto Nai Yoni (‘Let it not happen again’). But it is happening again. It’s happening to those children being separated from their families. The motto is not being lived up to. They’re creating concentration camps, and it’s happening in the name of the United States of America. 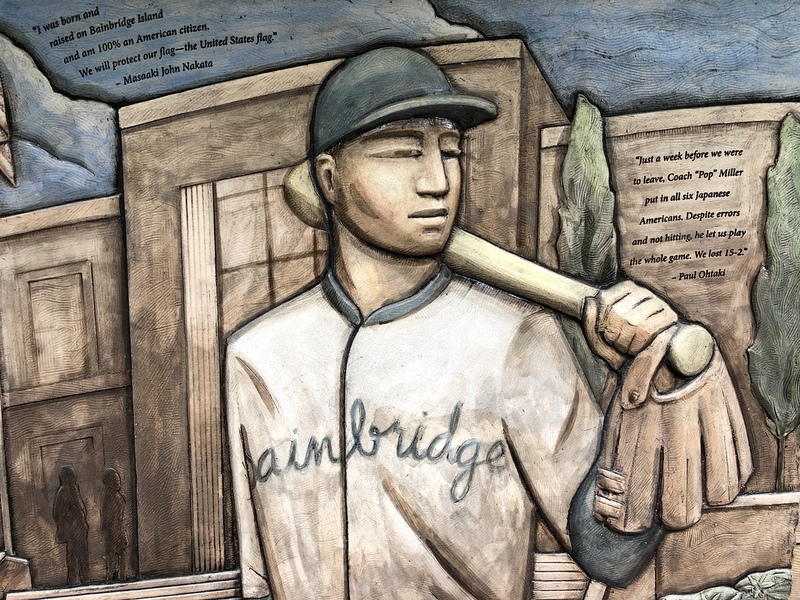 Just days before the evacuation of 1942, the Bainbridge High School baseball team opened the season against its traditional rival. 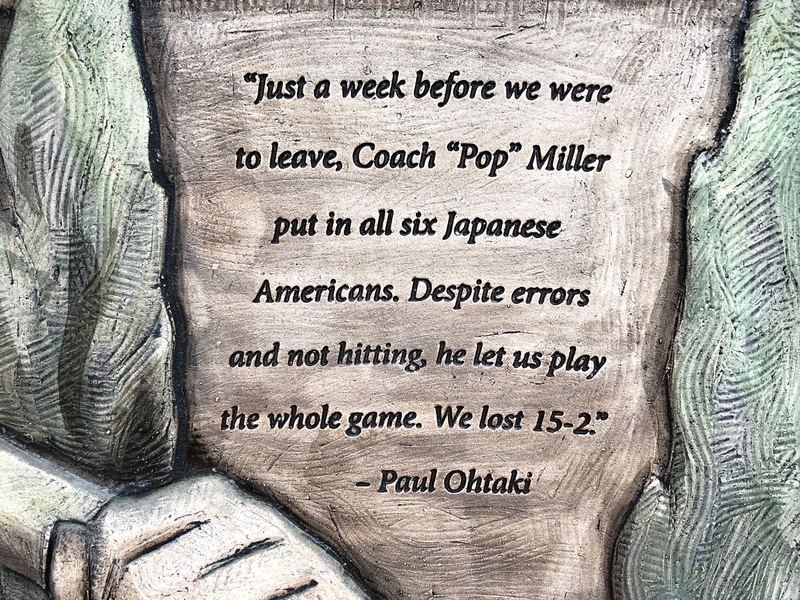 They wanted badly to win, of course, but instead of using only the best players, the coach, “Pop” Miller, made sure that all six Nikkei players not only took the field, but remained in the lineup for the entire game. They got trounced, 15-2, but no one seemed to care about all the errors and fruitless swings of the bat. All that mattered to the Nikkei––and to their teammates who cheered them on––was the joy of a love so much stronger than fear. 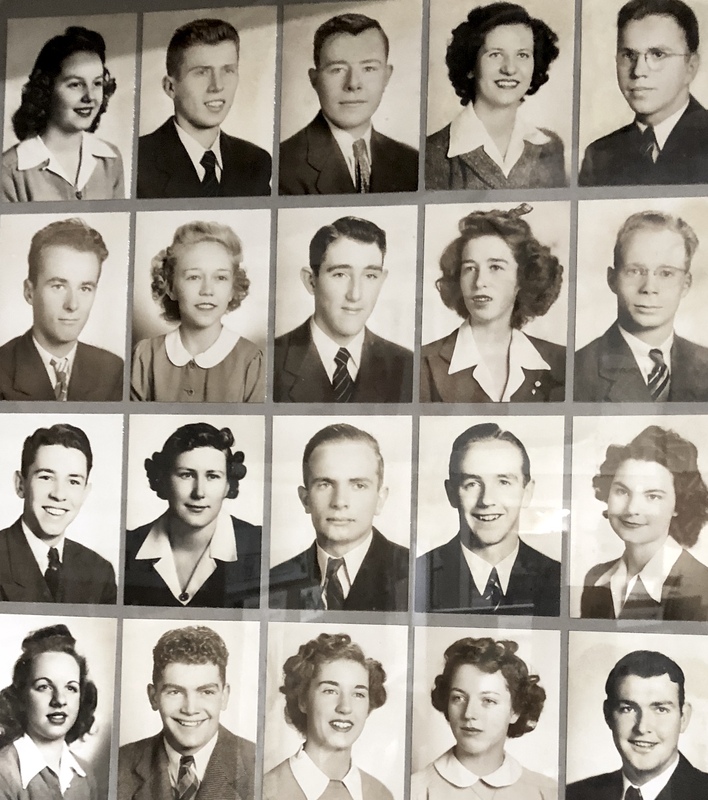 Among the many fascinating exclusion artifacts in the Bainbridge Island Historical Museum, none is more telling than side by side posters of the high school classes of 1942 and 1943. They make an indelible image of a community bereft by a terrible sense of absence. In the class of 1943, the faces of the Nikkei have all disappeared. Bainbridge High School Class of 1942. Bainbridge High School Class of 1943. But the students stranded in Manzanar would not miss their graduation. The principal sent copies of all the graduation speeches to the camp, along with diplomas for every exiled senior. Meanwhile, during the commencement ceremony back on the island, in the middle of the stage, there were thirteen empty chairs. 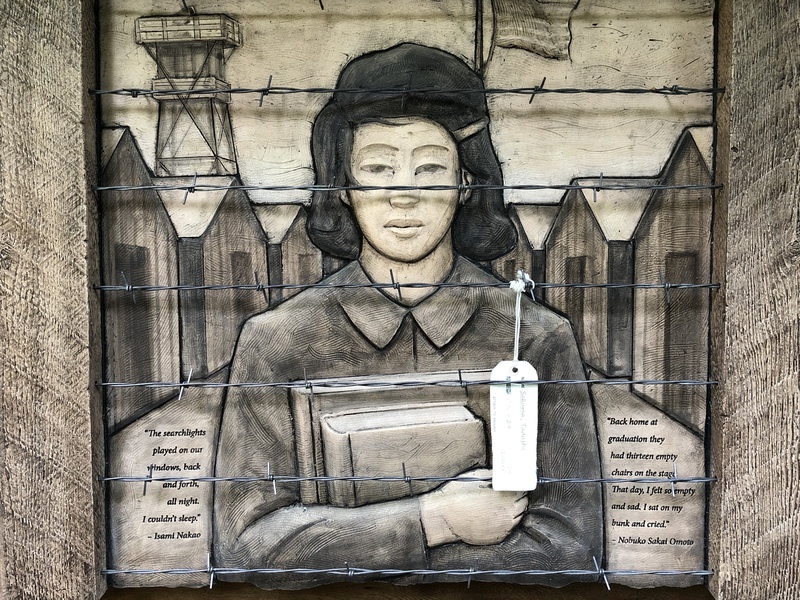 I am very grateful to Clarence Moriwaki and the Bainbridge Island Japanese American Community for their generous assistance in the making of this post. It was a privilege to engage with this unforgettable and challenging story and the enduring legacy of the people who lived it. Unless otherwise noted, all quotations are from the video oral histories on the Bainbridge Island Japanese American Community (BIJAC) website: (http://www.bijac.org/index.php?p=WELCOME) The ages given are of the interviewees at the time of their evacuation. Thanks to Clarence Moriwaki for his generous assistance with these sources. Fintan O’Toole, “Trial runs for fascism are in full flow,” The Irish Timesonline, June 26, 2018. Incredibly, Japanese legal resident aliens were not allowed to seek U.S. citizenship until the passage of the McCarren-Walter Act in 1952. Not all spent the war in the camps. Some joined the military and fought in Europe. Some were jailed. Some would be allowed to move outside the exclusion zone for work or school. But no one could return home until war’s end. Bainbridge Review, December 8, 1941. Cited on the BIJAC website. Mary Woodward, In Defense of Our Neighbors: The Walt and Milly Woodward Story(Bainbridge Island, WA: Bainbridge Island Japanese American Community / Fenwick Publishing, 2008), 118. This is a beautifully produced and moving account with many striking photographs and illustrations. My photos of the story wall are used throughout this post. Thanks to Steven Gardner and Johnpaul Jones for their exquisite artistry, and to Paul Dunn and Tracy Matsue Loeffelholz for their composite image of the wall and the historic photo of the evacuees walking toward the ferry. 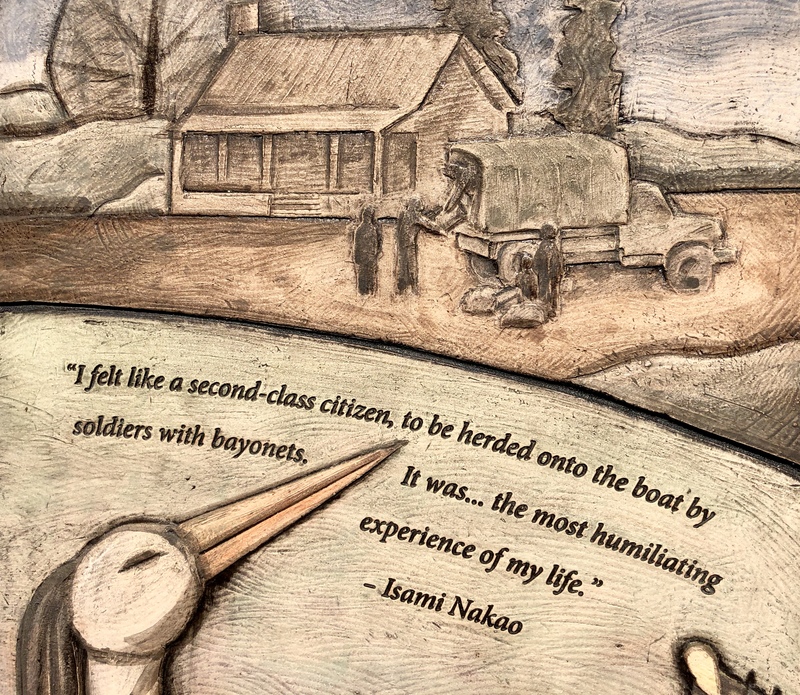 From a display panel at the Bainbridge Island Historical Society. Jim Friedrich interview with Clarence Moriwaki, July 2, 2018.